Life throws so much our way. The dedicated attorneys at the Law Offices of Jeffrey A. Herzog, P.A. are here to provide you with the highest quality legal services to help you through the various legal hurdles you may face as well as assisting you in preventing future legal problems. As a full service law firm with locations in Palm Harbor and Trinity, we proudly serve Pinellas and Pasco County residents. With unparalleled client support and a reputation for excellence, the Law Offices of Jeffrey A. Herzog are here to protect your legal rights and always advocate for your best interests. Often a client’s matter involves or overlaps with multiple areas of law. Because of our diverse practice areas, we are able to handle your legal needs simultaneously, which means your matter is handled more effectively and efficiently. Sometimes, despite our best efforts, we fall on hard financial times: you lost employment, encountered a health problem, or your business venture failed to take off. If you are finding it difficult to keep up with your mortgage, bills, or other debt payments, there may be help for you through bankruptcy protection. These things are always better to deal with sooner rather than later. While bankruptcy is a serious matter to consider, it can help keep a bad financial situation from getting much worse. We can help eliminate or stop garnishments or help you keep your home, but you must take the first step. Our knowledgeable bankruptcy attorneys are here to represent you through the bankruptcy process and help get you a fresh start towards financial stability and freedom. Contact our office to schedule a free consultation so we can evaluate and discuss your legal options with you. The buying and selling of a home is an exciting time for families. It is also one of the most significant financial transactions that many of us will go through in your lifetime. Without trusted legal counsel, you may end up in the middle of a stressful and expensive real estate transaction. Our attorney, who is also a licensed Realtor, will represent your best interests in all facets of residential real estate transactions. Our services also include drafting and reviewing leases, landlord-tenant matters, eviction services, quiet title issues, and partitions. We pride ourselves in always fighting for what is in our client’s best interest. If you are finding it difficult to make your mortgage payments or have been served with a foreclosure lawsuit, contact us right away. We will explore every avenue to help you save your home and come out of a difficult financial situation. If a loan modification, a short sale, or a deed-in-lieu of foreclosure are not workable options, we will defend you through the foreclosure process. Do not lose hope. 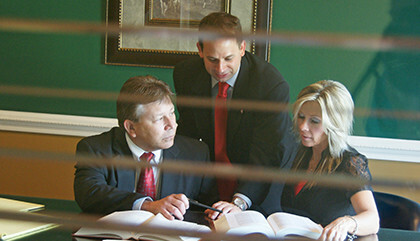 Our dedicated attorneys will not rest until they have done everything they can for you. If you have been appointed as a trustee or personal representative of an estate, you have a potentially long and complicated road ahead. Both trust and estate administration are full of obligations needed to be fulfilled if you have been appointed to one or both of these two positions. Failing to adequately perform these duties could expose you to personal liability. Let our attorneys help you succeed at this very important job while keeping you in compliance with Florida’s Trust and Probate Codes. Whether a trustee or personal representative, we are here to represent you every step of the way and navigate you through the probate process as we work together towards fulfilling your loved one’s last wishes. We work to tirelessly to craft an estate plan that will protect the future of you and your family.